RTP Applications - Ensyn - Renewable Fuels and Chemicals from Non-Food Biomass. Ensyn's RTP technology has multiple proven applications and has been successfully demonstrated in a number of industrial sectors. Ensyn's first commercial deployment of RTP was in the food chemicals business (1989), converting wood residues to liquids for the production of food products and heating fuels. RTP was also successfully demonstrated for the upgrading of heavy petroleum, and the rights to this non-renewables business was sold in 2005 at an enterprise value of US$100 million. 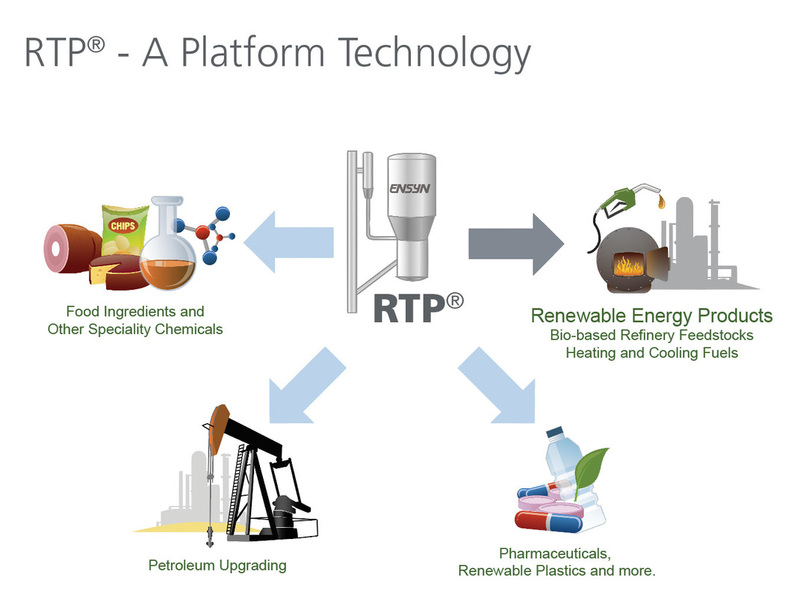 At the core of each of these applications is the same platform RTP technology that has been in use for the last two decades and which Ensyn is now deploying in the build out of production capacity for the fuels business. Ensyn’s RFO represents the dawn of a new renewable fuels industry. ​In the fuels application, Ensyn converts solid biomass (typically wood residues) in its RTP process to high yields of a biocrude. Ensyn’s RTP technology has been in commercial production for over 25 years. This production has been primarily dedicated to the production of food ingredients and renewable heating fuels. Ensyn is now ramping up its production capacity for a broader commercialization of heating fuels and to meet demand from refineries for biocrude as a renewable feedstock. The biocrude that Ensyn currently produces in its Ontario facility, and the biocrude that will be produced in expansion projects currently under development around the world, is essentially the same liquid product that has been produced historically, with similar yields and product quality, using the same fundamental RTP conversion process.